mental health, substance abuse and addictions. The information in this guide provides a framework for communities, faith groups, and community based organizations interested in developing or enhancing services for children, transition age youth, adults and elders who are experiencing or recovering from mental health problems, substance abuse or addictions. The guide is organized with this framework in mind. It is helpful to envision these services as a pyramid with three levels. 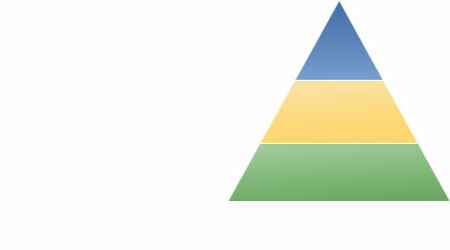 Place your mouse on a level of the pyramid for more information. Before deciding upon an area of service for your organization or community, it may be helpful to assess the needs and assets of the community you intend to serve. This is important even if you think you already have a good idea of the gaps in services for your area. There are a number of resources related to community needs assessment to help your organization carry out this step. Once you have determined the assets and needs of your community, you can begin to explore the types of services your organization or group can offer to make a positive difference in the lives of people affected by mental health problems, substance abuse or addictions. Each of the three broad areas of service are represented across the top of the page. Introductory information about the area of service is on the first page of each service area . 3. Gather information and resources to ready the organization and its members to effectively deliver the service. A drop down menu guides you to information and resources specific to the phase of service development you are interested in - planning the service, delivering the service or evaluating the service.